NOTE: anything to do with Proto-Indo-European religion is highly speculative, and the material in this article is no exception. This article does not represent any official opinion of Clann Bhride as a group. In the religion of the ancient Indo-Europeans, sacrificial offerings were given to the deity of the fire, who took a portion of the offering and conveyed the rest to the other gods. The Indo-Aryans who composed the Rig Veda conceived of this deity as a god named Agni, and also worshiped a goddess of the dawn named Ushas. Among the Greeks, the ancient goddess Aeusos seems to have become at least two deities: the dawn goddess Éos and the hearth goddess Hestia. Both names derive from the Proto-Indo-European root Aeusos according to the Proto-Indo-European Religion homepage. According to Greek mythology, Hestia was one of the twelve most important deities, a daughter of the Titan Kronos and the goddess Rhea. Like the rest of the Titan’s children Hestia was devoured by her father, but Zeus forced him to let her out of his stomach. 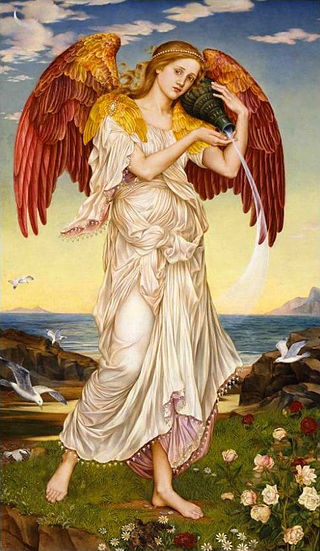 Apollo and Poseidon both wanted to marry her, but Zeus granted her request to remain a virgin forever. She became the goddess of the sacrificial fire and of the hearth-fire as well, making her the primary domestic goddess of the Greco-Roman world. Éos, unlike Hestia, was said to be sexually insatiable, having been cursed by Aphrodite for having an encounter with Mars. Éos is also a Titan rather than an Olympian goddess, and this is an interesting point in its own right. According to the Proto-Indo-European Religion homepage, the theonym Aeusos implied any shining or glorious deity as well as the specific goddess of the dawn and sun. As such, it gave rise to a number of words for gods or families of gods in the Indo-European languages, including Aesir (the Norse gods) and Asura (the Indian anti-gods). The Asuras or anti-gods of India are the functional equivalent of Greek Titans or Irish Fomorians, so the fact that the Greek dawn goddess is really a Titan is interesting. Éos is a Titan, but she wasn’t overthrown when the other Titans were and is accepted as one of the Greek gods by the Olympians. (Several other Titans were as well.) Brighid is one of the Tuatha De Danann, but she has strong Fomorian connections- her husband and son both fight for the Fomorians against the gods. I wonder if we should see Aeusos as a goddess who rejected the Pandemonium, seeing the mutual demonization between the gods and the anti-gods as merely destructive propaganda. The Romans called their dawn goddess Aurora and their hearth-goddess Vesta. Again, both words seem to derive from Aeusos. The Vestal Virgins, Roman priestesses dedicated to Vesta, tended an eternal flame just like the Brigidine nuns of Kildare. In the Baltics, Aeusos became the dawn goddess Aušra and the morning star goddesses Auseklis and Aušrine. There is also a Baltic sun goddess named Saule or Saules Mate (“Mother Sun”). She carries the sun across the sky every day in her copper chariot drawn by three yellow horses, riding for her castle in the western sea. Saule, like Brighid, is a goddess of great compassion and warmth, and like Brighid she is often portrayed as a mournful deity. Saule is always weeping about one thing or another- the fall of an apple (a symbol of the setting sun), the fall of leaves in the autumn, the marriage and departure of one of her many daughters. In one version of her mythology, she drowns in the waters of the ocean every night. In another version she never rests, driving her chariot across the sky all day and sailing a golden boat across the sea all night. Saule has a problematic relationship with Mēness, the god of the moon. In one version of the myth from Lithuania and Latvia, Saule marries Mēness but the moon god cheats on her with – ironically enough – the dawn goddess. The thunder god Pērkons or Perkūnas chops him up for this affront. In another version of the myth, Saule herself does the dismembering. Saule wears either red or gold and has silver shoes and a silver crown. She is a protector of orphans and non-venomous snakes, and a goddess of fertility. Baltic farmers traditionally prayed to her twice a day, at sunrise and sunset. Saule is worshiped at midsummer and midwinter, but her primary holy day is the midsummer feast of Līgo. At the Līgo festival, Baltic people honored her by jumping over bonfires, dancing and wearing floral wreaths. It was believed that Saule danced on a hilltop at midsummer wearing a wreath of red flowers. Dawn with great glory, Goddess, Lady of the Light, dawn thou with riches, Bounteous One. They, bringing steeds and kine, boon-givers of all wealth, have oft sped forth to lighten us. O Uṣas, waken up for me the sounds of joy: send us the riches of the great. Which, as she cometh nigh, have fixed their thought on her, like glory-seekers on the flood. The. princes who, O Uṣas, as thou comest near, direct their thoughts to liberal gifts. Rousing all life she stirs all creatures that have feet, and makes the birds of air fly up. She sends the busy forth, each man to his pursuit: delay she knows not as she springs. O rich in opulence, after thy dawning birds that have flown forth no longer rest. Borne on a hundred chariots she, auspicious Dawn, advances on her way to Men. To meet her glance all living creatures bend them down: Excellent One, she makes the light. Uṣas, the Daughter of the Sky, the opulent, shines foes and enmities away. Bringing to us great store of high felicity, and beaming on our solemn rites. For in thee is each living creature’s breath and life, when, Excellent! thou dawnest forth. Borne on thy lofty car, O Lady of the Light, hear, thou of wondrous wealth, our call. O Uṣas, win thyself the strength which among men is wonderful. Bring thou thereby the pious unto holy rites, those who as priests sing praise to thee. And, being what thou art, vouchsafe us kine and steeds, strength meet for praise and hero might. Grant us great riches, fair in form, of all good things, wealth which light labour may attain. O Uṣas, graciously answer our songs of praise with bounty and with brilliant light. So grant thou us a dwelling wide and free from foes. O Goddess, give us food with kine. To all-subduing splendour, Uṣas, Mighty One, to strength, thou rich in spoil and wealth. Let red steeds bear thee to the house of him who pours the Soma, juice. Therewith, O Daughter of the Sky, aid men of noble fame today. And round about flock winged birds from all the boundaries of heaven. Thou dawning with thy beams of light illumest all the radiant realm. Thee, as thou art, the Kaṇvas, fain for wealth, have called with sacred songs.